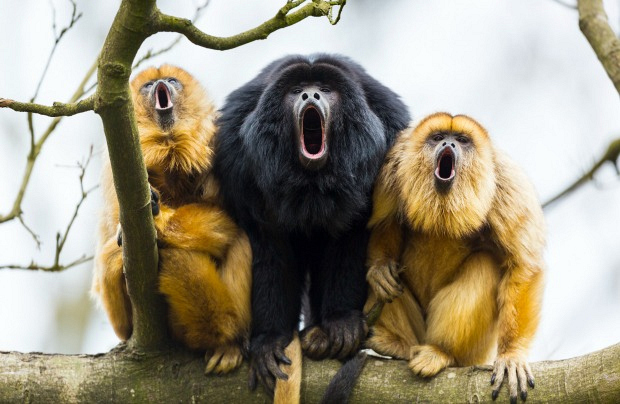 Howler monkeys can be heard three miles away. When a troop of howlers call out together, usually at dawn or dusk, their cries can be heard up to three miles away. As the loudest land animals on earth, their voices cut through the dense forests of Central and South America in which they reside. The males have large throats and specialized vocal chambers, allowing them to amplify their distinctive call. This indicates to other monkeys that their troop has occupied a territory and that others should stay away. Most howlers live in groups, with one or a few adult males, multiple females (usually maintaining a ratio of one male for every four females), and their offspring. When grown, the young adults leave to join new troops.